The brand, ShowMaven, tripod projector screen endeavors to become an expert or maven in show, display field. US Stock, fast delivery. Shipping by USPS, FEDEX AND UPS. This tripod projector screen features perfect image effect, easy installation, lightweight, odorless, wrinkle-free, steady, durable. Because we are using 300D matte white screen fabric and high quality tripod stand instead of 150D screen that other sellers commonly use. 1. Ideal for home theater movies, classroom training, conference room presentations, public display, etc. 4. Viewing Area (W x H): 87" x 49"
★ ENHANCE IMAGE EFFECT: To achieve a perfect image effect, odorless, wrinkle-free and durable, using 300D matte white projector screen fabric instead of 150D screen that other sellers commonly use. The black back side of screen helps to eliminate light penetration. Moreover, the design of four-side black boarders, 160 degree wide viewing angle and 1.3 high gain projector screen absorb projector overshot light and reach perfect visual effect. ★ LARGE VIEWING AREA AND STORE CONVENIENTLY : Projector screen features diagonal 100 inch, viewing area 87" x 49" and 16:9 aspect ratio. It is perfect for home theater, office and school classroom using. Projection screen has a compact folding size , (87.01 x 7.48 x 1.97)" / (221 x 19 x 5)cm (L x W x H), which is to be stored conveniently. 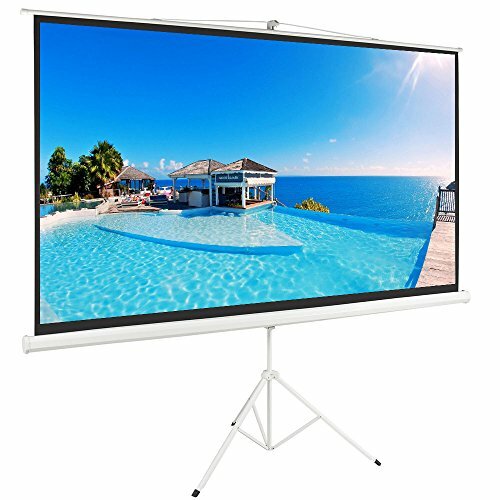 ★ PORTABLE PROJECTOR SCREEN STAND AND WIDE-RANGE APPLICATION: Tripod projector screen with stand features adjustable height function, heavy duty manual pull down tripod projector screen is perfect for shift projection task, home theater, office, and school use. ★ EASY INSTALLATION AND STEADY: Outdoor projector screen features simple tripod legs and 4 rod spring tensioning system, which make it steady and assembled quickly. 100 inch projector screen tripod installation is a breeze. ★ ADJUST HEIGHT EASILY AND LIGHTWEIGHT: Solid and durable tripod HD 16:9 Projector screen's mount locking mechanism helps lock the height into place easily. It is lightweight and portable.